Hampton Creek is located out Apalachee Parkway just before you reach Apalachee Regional Park, and contains 200 homes that are relatively new. 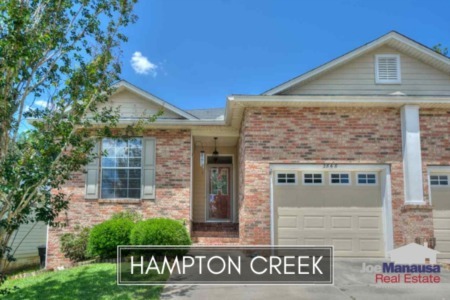 Whether you are in the market for an attached or detached home, there are still some great bargains to be found in Hampton Creek. 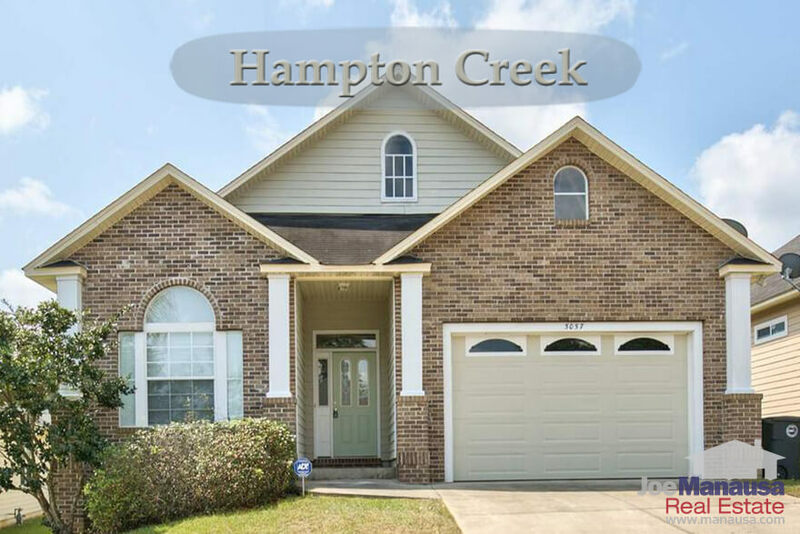 The single family detached homes and townhouses in Hampton Creek remain an EXCELLENT option when you cannot find something brand new that fits your budget. You can still find homes for sale in Hampton Creek priced below $160K, but do not expect this to last forever. The need for homes is on the rise and the cost of construction is far higher today then it was when these homes were built. Hampton Creek is a buy and properly marketed homes will sell right away. The remaining report shows graphs that include the long term average home price trends, value trends, and size trends of homes sold in Hampton Creek, and finishes with a table of ALL closed home sales going back to the first year that homes went on the market here (2005). It is important to note that the narrative contained below is for sales through December for all previous years, but through the end of June in 2017. The graphs and the closed sales table will be continuously updated into the future (meaning bookmark this page if you always want to know the current status of homes in the Hampton Creek). Average home prices moved around a bit based upon the ratio of single family detached homes selling to townhomes selling. The former fetch more money so if they are concentrated in the sales results, average prices move higher. The current $158.800 average home sales price is the highest we've reported since 2009. 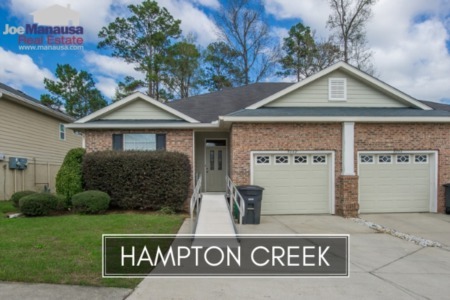 Currently, there are 8 homes for sale in Hampton Creek and 3 are already under contract, which is a lower ratio than what we are seeing around Tallahassee. This really shouldn't be the case as this is a highly desired price range in our market right now. Sellers, meet with your agents and fix what is not working. Buyers, get in there before these prices are gone for good! Average home values in Hampton Creek are up nearly 8% this year when compared to last year's average. This is great news for homeowners who have been upside down in their equity positions due to the crash of the housing market. Expect continued movement higher as buyers swoop in on these great homes. Remember, higher values equate to "freeing up the market." 25% of our market (that wants to move) have been trapped owning a home that has negative equity. As values move higher, these owners can move ... that is why rising values equates to increased demand in the Tallahassee real estate market. The average home size sold in Hampton Creek typically falls in a range of 1,200 to 1,500 square feet, and this year is no different. The 7 sales thus far in 2017 have averaged 1,293 square feet. The following list shows more than 300 home sales in Hampton Creek going back to the very first one which occurred in 2005. I hope you enjoyed our July 2017 update on home sales in Hampton Creek, please feel free to drop me a note if you have questions not covered in this report. Have You Seen All The New Home Construction For Sale In Tallahassee?